The interactive display market has been steadily growing over the past years. The exponential rise of Internet penetration and the need for simpler human-machine interaction has vastly contributed to this phenomenon. This trend is expected to continue; displays are expected to be incorporated in even more devices in the future, so understanding this emerging market can enable engineers to reap its economical benefits. We recently sat down with Markku Riihonen, Global Product & Business Development Manager at 4D Systems to get his thoughts on where the display industry is heading. Here is what he had to say. Markku, what is it exactly that you do at 4D Systems? At 4D Systems we design and manufacture compact and cost effective intelligent display modules with LCD or OLED technologies. Most of our display models also include a touch sensor, capacitive or resistive, for interacting with the device so essentially our solutions allow easy integration of a display with full graphics, including touch functionality to almost any type of application that you can think of. We also provide the hardware and software tools to make it fast, easy and cost effective to add functionality to various applications. We act like a one-stop-shop for embedded display solutions. Do you think that there are more and more non-expert interested in touch screen applications nowadays? And if so, how important is to you that easy and intuitive tools exist so that they don’t get discouraged by the complexity of these applications? I think it is very important because our a large part of our customer base is just that. There are a lot of device manufacturers out there who are looking to replace physical buttons, switches or any sort of input device of their products with touch sensors or touch screens, or they’re already using a display as an output to a specific product and they want to incorporate the input, turning it into a touch screen. The problem these developers face is that even though they are typically experts in their particular fields, they don’t necessarily have the expertise to integrate the display into their product. And indeed, developing it from scratch and incorporating it can be quite challenging; finding all the different components you need to put a display into something, learning how to drive it, writing all the drivers and code, all those tasks require expertise. So, many manufacturers and designers of this kind opt out of putting a touch screen in their product, even though it would be desirable, simply because they either lack the expertise or they cannot make the investment in that direction, since it can be time consuming and risky. When they choose our solutions, like the gen4 Series Intelligent Display Modules, a non-specialized engineer is able to create a GUI and then integrate it with his host controller. So, essentially, they use our tools and modules to integrate the display in their product. This way, both the expertise needed and the time to market are substantially reduced . All in all, I think that ease-of-use is one of the most important needs of the customers. As you said, the interactive display market has steadily been growing for the past years. Do you see this trend continuing, or maybe growth will be hindered due to factors such as the rising cost of materials? I think there is a lot of growth still happening and still to happen, mainly because of the proliferation of touch screen technology through mobile phones, tablets and now computers. End users of almost any electronic device expect some kind of good looking graphical interface with touch capabilities. There are still a lot of devices that could use a touch screen but don’t, due to the cost and complexity of the design-in process. A huge volume of the market still remains untapped. So, we do see this happening more and more, whether it is with a display or it being a touch sensor, either way there is a huge amount of potential still for a long time to come. The interactive display market has more growth capacity left. Why do you think touch screens are replacing physical interfaces? There are 2 main reasons for this: first, it’s a trend, people think they are cool and are used to them. Naturally, there are applications where a touch screen interface is not suitable. Particularly in applications where it is not possible to look at the interface all the time and the user needs to focus on something more important like driving a car. But overall a touch screen can bring added convenience to the operation of a device by the end user. The second reason is that a graphical user interface with touch allows device manufacturers to simplify their designs and reduce their bill of materials. Multiple buttons, switches as well as gauges and other information displays can be integrated into a single design on multiple pages for example. A GUI interface can even include the user manual and instructions for the device in question helping the manufacturer and designer provide a better user experience for the end user. Now, let’s get down to more technical aspects. In the current interactive display market it’s the projected capacitive touch screens that dominate for a few years now. Do you see that changing any time soon? I’m not actually sure of what may be coming so I can’t comment on that. The capacitive touch is something that is of course the one that is everywhere because of handsets and tablets and so on. But the 2 dominant ones are resistive and capacitive, and resistive touch is still very popular, especially in markets or applications where you need to use the devices with gloves on. Each touch type has its benefits and uses depending on the application, but pcap definitely is the most popular technology on consumer goods. In the past few years, we saw the touch screen technology leapfrogging. Now, some suggest that the technology has matured and we’ll see less innovation happening in the future. What’s your take on this? It’s difficult to say. In a way, ultimately, I would kind of agree that if you think about touch screens and the mechanical side , the actual touch screen itself is at a good level. The responsiveness of the touch and the graphics are extremely good these days. Ultimately, much of the innovation is in fine tuning the technology and perhaps more importantly about good user interface design. Curved and particularly flexible touch surfaces may be things that will be big in the future. Device manufactures can get more creative with their designs when it comes to the mechanical designs of products. It’s exciting to see where things will be in the next 5-10 years. Curved and particularly flexible touch surfaces may be things that will be big in the future. So, in the near future, you see less innovation happening? In terms of touch screen technology itself, there is room for improvement in terms of materials and what is happening ‘on the inside’. Making screens less susceptible to interference, reducing material costs, improving production processes etc. I’m sure that there is quite a lot of work going into that. On the innovation that you see on the surface, that’s difficult to comment on, these kind of things just happen under the surface, where the real improvement or innovation comes into play. [On the interactive display market] there is room for improvement in terms of materials and what is happening ‘on the inside’. On the other hand, and as mentioned before, there is a lot that can and is being done on the the interface design itself. The two go hand in hand, hardware and software. A good example of this could be the force touch feature on Apple products. The feature is there, and many applications on the platform are making good use of it. However, there are still many applications that are not taking advantage of this hardware feature. The innovation is definitely still there, but perhaps less visible or drastic than we’ve seen in recent years. It’s really about better user interfaces that end users will find more useful and intuitive to use. Now, let’s talk about new product development. What’s the process you follow at 4D Systems when designing a new product? How do you integrate the touch sensor in it? Essentially, we produce a complete hardware and software solution that helps our customers design-in a full colour display with touch capabilities. Our customers come to us for an easy-to-use and cost effective solution for their display needs, so they can focus on the high-level design and their core application. This makes our design process extremely customer centric and we pay close attention to what our customers request and how they are using our products. As our Intelligent Display Modules are used as development tools as well as components in final products, we need to provide long term supply with minimal changes that could affect the end customer. These days many of our products are improved iterations of an existing design that allows customers to have a seamless change from one product to the next. Typically these iterations are about better overall performance and reduction of the Bill of Materials, which essentially allow us to pass on the cost savings to our customers. New products normally stem from a need that we receive from customer feedback and market trends in our industry. We collate these needs into a feature list, which we then pack into a single solution that can serve as many users as well as possible. In terms of the design process, I would imagine it is quite typical to others in our industry and goes through the usual steps of designing, prototyping, testing, fine tuning, pre-production runs and then finally production. For touch sensing and display drivers we utilize components that are available in the market and have the display elements manufactured custom for us. There are many touch sensors and display drivers available and these may change over time or become discontinued and replaced by others. Over the years, we have developed our own tools to easily configure our custom graphics controllers to drive a variety of sensors and display drivers. This in turn allows us to provide our customers a seamless experience in their use of our solutions even if there have been changes on the ‘insides’ of our products. I cannot go too much into detail on this as this is our core IP. How much of a major role will IoT be playing in the near future? Definitely a big role. There is a huge amount of hype about Internet of Things and it doesn’t seem to be slowing down. Ultimately, it is about a network of interconnected devices from which information can be collected and processed and then utilized elsewhere to improve overall quality of life. Sending your health data to your doctor from your wearable, or having traffic congestion information available on Google maps for example. Although it feels like IoT is something relatively new it is already playing a major role, and will continue to do so as technology develops and new uses for all the cloud processing power are being discovered. There is a huge amount of hype about Internet of Things and it doesn’t seem to be slowing down. What’s your advice on how to design interactive displays, based on your vast experience? Focus on good user interface and usability. It’s one thing to have something that works, typically an engineers approach to something, but it’s different to have something truly user friendly and intuitive. So focus on usability testing for making a nice interface. You can have something really fancy looking, but if people can’t use it intuitively, you’ve done something wrong if the user needs a user manual. Once your functional prototype is working, it’s worth going back and having a look at how intuitive it is to use it. Good user interface design is the key. [When designing interactive displays]…focus on good user interface and usability. Finally, let’s talk a bit about the future. Where do you see the interactive display market heading towards in the next 5 years? From the perspective of our market, which consists of design engineers, hardware engineers and software engineers, we see that the distinction between these engineers is becoming less and less obvious, and you may be seeing hardware engineers doing software development and vice versa. We also see more and more companies taking advantage of modules as sub-assemblies in their designs rather than designing from the ground up. There is a generational shift that we are seeing where younger engineers are more willing to use something that is already complete to be able to complete their designs faster and thus reduce time to market. Thank you very much for being with us today Markku, it was a pleasure ! 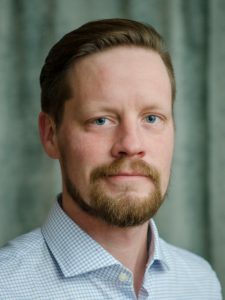 Markku holds a Bachelor of Business Administration Degree from Haaga-Helia University of Applied Sciences in Helsinki, with focus on Marketing and Knowledge Management. Markku began his career at The Economist Group’s EMEA operations in Vienna, Austria in 2004 as Business Development Manager organising The Economist Groups Business and Government Roundtable Conferences in the region. In 2009 Markku joined one of 4D Systems European Distribution Partners in Austria and helped solidify 4D Systems’ position as the Display Solutions Provider in the region. In 2015 Markku joined 4D Systems in a full-time role as Global Products and Business Development Manager while also overseeing the establishment of 4D Systems regional EMEA office in Vienna Austria. At 4D Systems Markku is responsible for being the glue between the different departments of 4D Systems in coordinating and making sure that new products and solutions are delivered to customers on time in an orderly fashion. In addition, Markku manages relationships with 4D Systems’ Distribution Partner network and key customers. During his free time, Markku enjoys reading and the occasional round of golf when time permits. Giorgos is an Electrical Engineer and serves as the Technical Content Manager of Fieldscale. He loves books, movies, coffee, and is a major dog person.